iKeyp you safe, yes? Well, not you, per se, but iKeyp can keep some of your valuables and important stuff out of sight and out of reach to anyone who might want to pilfer your pills, purloin your passport, or take off with your $2,000 Boba Fett action figure. 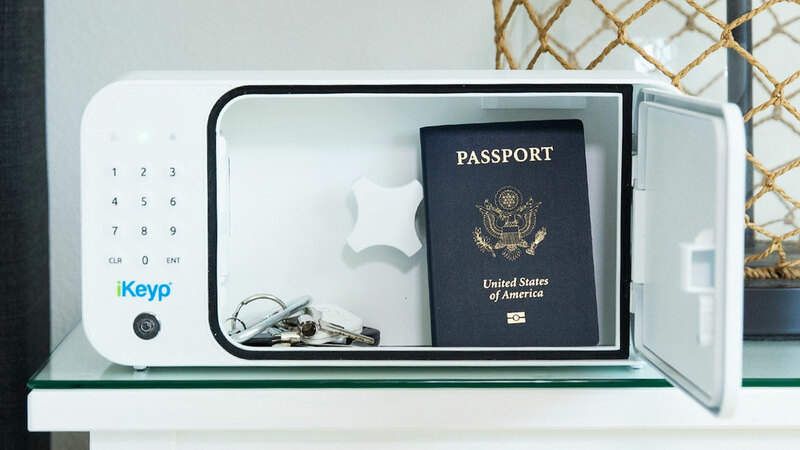 The iKeyp is a smart personal safe with WiFi connectivity that makes unlocking and accessing your stored items as convenient as securing them. You can open the iKeyp with your smartphone, its built-in keypad, or backup key, so lots of choices to suit your mood...and make sure you as rightful owner are never locked out. Remote activation / deactivation is also possible with the iKeyp app. iKeyp smart safes come in 2 styles: a screwless version with extendable wings you can sit or wedge in on countertops, shelves, and medicine cabinets; and a screw-mounted safe for more permanent installation on a wall. The safe is large enough to store up to 8 prescription pill bottles, with interior dimensions of 4.6" high x 8.4" wide x 2.5" deep. Interior storage is sealed and humidity-resistant. The iKeyp is also equipped with a built-in siren to thwart tampering. For a limited time you can grab a screwless or screw-mounted iKeyp smart safe for 33% off retail value.